Sullivan & Cromwell has the global perspective—and reach—to assist clients on their most important transactions involving Latin America. S&C has played a prominent role advising clients on their most significant matters in Latin America for more than 100 years, a track record that is hard to match. 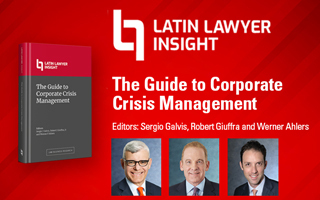 This broad and deep knowledge, coupled with the Firm's decades-long relationships with Latin America's top local law firms, provides S&C clients with a seamlessly integrated approach to their most complex issues. S&C's Latin America practice is global in nature in terms of the clients the Firm represents, the types and locations of the matters, and the S&C lawyers who work on them. The Firm's work in the region is led out of New York and involves leading S&C lawyers in Asia, Europe and the United States. This approach reflects the role of Latin America in the global economy. S&C's work in Latin America dates back to the creation of the Panama Canal in the early 1900s. Since then, the Firm has been involved in major milestones in capital markets, foreign investment, mergers and acquisitions, project finance, sovereign finance, restructuring and dispute resolution matters across a wide range of industries in the region, including oil and gas, power, mining and metals, financial services, telecommunications, insurance, infrastructure, airlines, manufacturing and consumer products. S&C's clients value the careful, creative and practical approach the Firm's lawyers bring to complex work. S&C approaches each matter in Latin America with a pragmatic focus on the commercial context—assisting clients to achieve their business objectives while seeking to effectively manage their risks. For each engagement, S&C seeks to field the best team of top-ranked lawyers from across its practices for each matter involving Latin America. This, coupled with the Firm's generalist training, results in greater adaptability, creativity and innovation. For more information please read S&C's 2018 Latin America Update, a report on recent developments in S&C's Latin America practice, along with views on important topics affecting business in the region.